The first recipe I ever shared on my blog back in the day was this Spiced Oatmeal Pear Bake so I thought it was only appropriate to share a baked oatmeal recipe first on the "new" site. Life coming full circle via baked oatmeal! Baked oatmeal is totally underrated. It's so easy and yummy and just all around awesome. It can be a breakfast, snack, or dessert, and can easily be prepped ahead of time and heated up right before serving. Since making this, I have eaten it for breakfast in the morning....as an afternoon snack....and as an after dinner treat, topped with my favorite cashew milk ice cream. YUM! I ate some right when it came out of the oven (duh) and have been heating up leftovers ever since. I swear, it tastes just as good heated up. I've had some baked oatmeals that get a little dry and just kinda "blah" when you reheat it, but not this recipe! This recipe stays moist (I know a lot of people hate that word...sorry), flavorful, and fresh. Not only is it easy to throw together, but baking this will fill your home with the coziest, most delicious smell. It's honestly reason enough to make it! This recipe is the perfect combination of fresh flavor and hearty sustenance. It feels bright and light thanks to the berries, and is also packed with healthy fats by way of hemp seeds and pecans. It’s so crispy, nutty and delicious! This recipe is like a love letter. It's my way of showing you some love to say THANK YOU (!!) and can be your way of showing your bod some love with delicious, hearty nourishment. 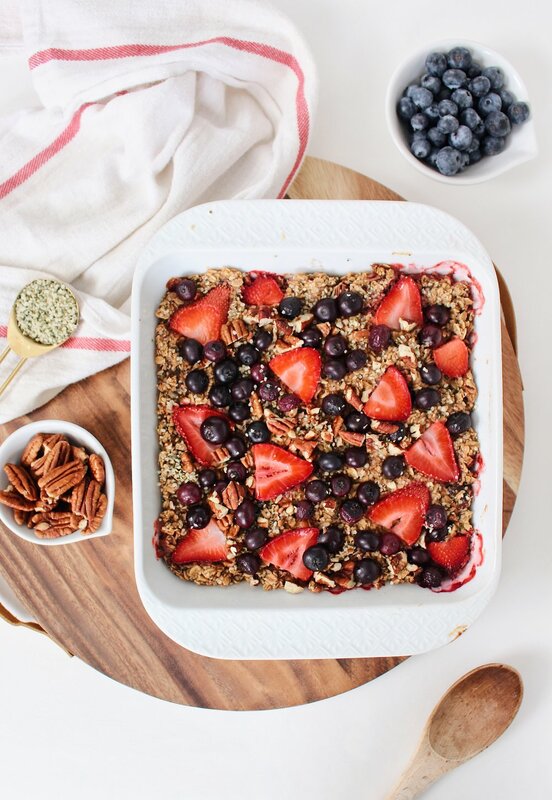 A berry delicious love letter that I can't WAIT for you to try! Preheat the oven to 350°F and spray an 8x8-inch baking dish with cooking spray or rub with coconut oil. In a small bowl, combine the flaxseed and water and set aside to thicken for about 5 minutes. In a large bowl combine the oats, hemp seeds, baking powder, cinnamon, and sea salt. In a medium bowl, combine the almond milk, maple syrup, vanilla extract, and coconut oil and whisk to combine. Add in the flaxseed mixture and stir until smooth. Pour the wet ingredients into the bowl of dry ingredients and stir to combine. Fold in the chopped dates and chopped pecans. Layer the strawberries in the baking dish and spread the oat mixture on top. Sprinkle with the blueberries. Top with additional hemp seeds and pecans if desired. Bake for 30 minutes or until the top is crisp and the middle is set. Remove and let cool for about 10 minutes before serving.